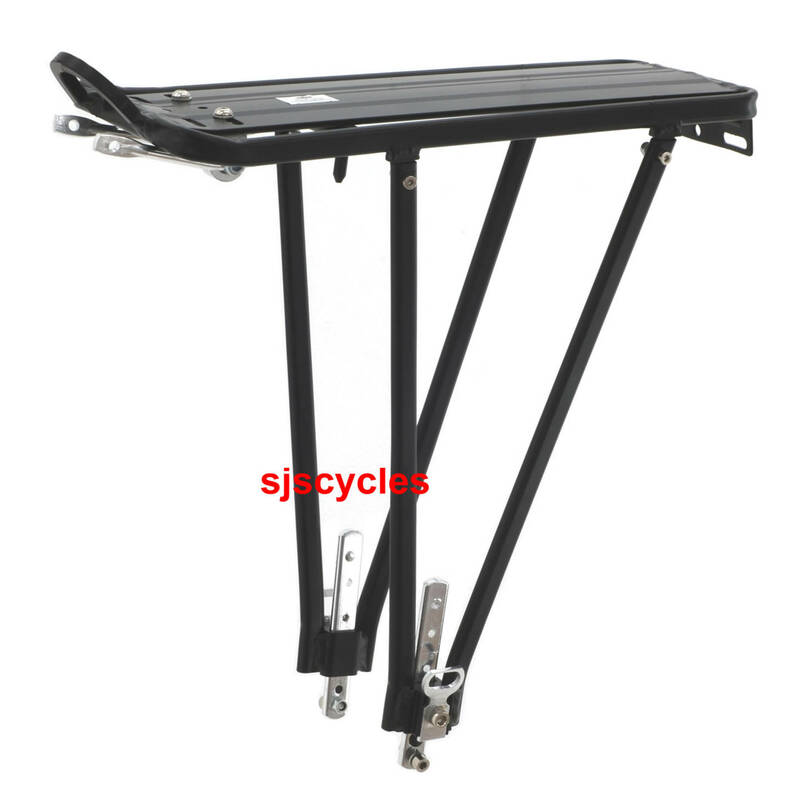 Quality Lightweight Black Alloy Rear Rack. Integral Bracket for Rear Light. Adjustable to fit 26" and 700c Wheels. Cheap & Crude But Does The Job. Quality doesn't look great - on my example the supports were twisted at random angles and there is play where the tops bolt into the platform - but it does the job pretty well. I had to wait until I got to my destination before I could write a review on this product. Having now used it on a tour from Katwijk aan Zee Netherlands, to Calw in the Black Forest Germany, initially following the Rhine, I can only say that this product was a super buy and served me well without letting me down at all, carrying 12kg luggage pannjiers all the way over 3 weeks. Does the top platform detach from the supports so that the whole assembly can be packed flat for transportation? Also would Carradice or Overboard clip-on panniers fit the rails? Yes, this will come flat! Most panniers including the Carradice ones will fit. Does It Come With An Attachment To Fit To The Mudguard/Rear Brake Bridge? it does not I'm afraid, it only come with attachments for fitting to dedicated upper rack mount. How Much Weight Can This Rack Carry? This rack has a carrying capacity of 25KG.